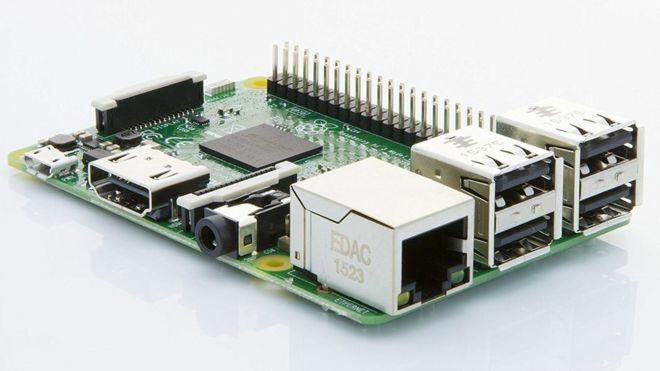 The Raspberry Pi has won the UK’s top engineering award. The team behind the device was awarded the Royal Academy of Engineering’s MacRobert Prize at a ceremony in London last night. The tiny computer launched in 2012. Its designers hoped to introduce children to coding and had modest ambitions. They beat two other finalists, cyber-security company Darktrace and radiotherapy pioneers Vision RT, to win the prize. Previous winners of the innovation award, which has been run since 1969, include the creators of the CT (computerised tomography) scanner; the designers of the Severn Bridge; and the team at Microsoft in Cambridge that developed the Kinect motion sensor. A tiny cheap computer that might encourage youngsters to learn programming was the idea of a small team of scientists and Cambridge University academics. They hoped to sell a few thousand units, but sales have now passed 14 million, and the Pi is widely used in factories as well as in classrooms and homes. One of the MacRobert award judges, Dr Frances Saunders, said a small engineering team had redefined home computing. “The Raspberry Pi team has achieved something that mainstream multinational computer companies and leading processing chip designers not only failed to do, but failed even to spot a need for,” she said. Back in 2011, computing academic Eben Upton and games designer David Braben came to the BBC to show me an early prototype of the Raspberry Pi. The video I shot on my phone of the device went viral, proving the potential appetite for the computer. I caught up with Eben Upton, now the chief executive of Raspberry Pi Trading Ltd, as he was arriving in London for last night’s award ceremony, not yet knowing that his team had won. “This is the big one,” he told me.